Dr. Daniel Yergin has just published "The Quest," "a magisterial masterpiece," according to an endorsement by Dr. Lawrence Summers, a well known economist and ex-President of Harvard University. Mr. Yergin received his B.A. from Yale University in 1968, and earned his Ph.D. in International Relations (1974) from Cambridge University. Mr. Walter Isaacson, a writer and biographer, and President of The Aspen Institute. Dr. Henry Kissinger, who received his A.B., A.M. and Ph.D. degrees at Harvard University. His doctoral dissertation was titled "Peace, Legitimacy, and the Equilibrium (A Study of the Statesmanship of Castlereagh and Metternich)." Mr. Steve Coll, a journalist and writer, and President of the New America Foundation. Mr. Fred Krupp, an environmental lawyer from the University of Michigan, and CEO of the Environmental Defense Fund. Mr. Frederick W. Smith, B.A. in economics from Yale University, CEO of FedEx Corporation, and a fraternity brother of George W. Bush. Dr. Susan Hockfield, B.S. in biology from the University of Rochester, Ph.D. in Anatomy and Neuroscience from the Georgetown University School of Medicine, and President of MIT. What do Mr. Yergin and these seven pillars of the East Coast establishment have in common? The answer is simple: These otherwise wonderful people would not recognize crude oil or condensate raining on their heads, and have no idea how to find hydrocarbons, and recover and process them. Most would be gravely challenged when asked to solve a quadratic equation. So how exactly, in Dr. Kissinger's words, "The Quest, by Daniel Yergin, one of world's most experienced and influential authorities on global energy, may well become the definitive work on the science, history and economics of this most complex and important subject"? Excuse me, but aren't science and engineering qualifications still relevant in this post-1984 world? Who am I to say, a mere petroleum engineer, who has dabbled in the recovery of hydrocarbons by every conceivable method over the last 30 years? I cannot say, because I am not fluent in the newspeak, do not practice real politik, and am not aroused by the slogan Ignorance is Strength, next to War is Peace and Freedom is Slavery. Thus, I will stick with what I know well: science and engineering. Which brings me to the delicate subject of Dr. Marion King Hubbert, who is cavalierly dismissed by Mr. Yergin as "one of the most controversial" earth scientists of "his time." Being a skilled propagandist he is, Mr. Yergin must dispose of Dr. Hubbert since he wants to convert the readers to his deeply held faith in an infinite supply of crude oil (mixed with infinite amounts of gas condensate and biofuels). In fairness to Mr. Yergin, he seems to be admitting between the lines that the Everlasting Oil Plateau party is over, especially when one considers the two biggest party poopers: China and India. One needs, however, to dig deeply, and into Mr. Yergin's earlier proclamations of the glorious future to get this message. In 2005, Mr. Yergin predicted a "large, unprecedented buildup of oil supply in the next few years." In 2011, he no longer was so ebullient. But I digressed. For the record, Hubbert was a genius Ph.D. physicist from the University of Chicago, a geologist, and one of the two best American-born scientists ever. The second was Josiah Willard Gibbs. 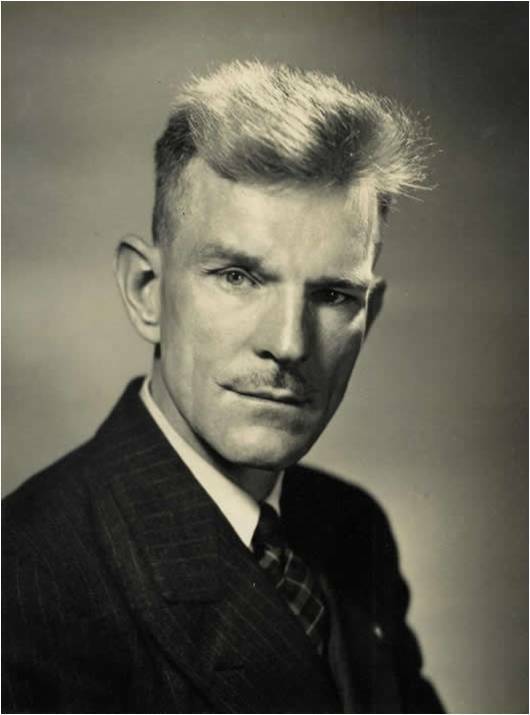 Under Hubbert's leadership, Shell Development became the Bell Labs of the oil industry, a spectacular achievement not replicated ever since anywhere in the world. I am one of many grandchildren of King Hubbert. Academia is permeated with us: Professors George Hirasaki, Larry Lake, Lynn Orr, Gary Pope, Skip Scriven, and Harold Vinegar, all members of NAE, are but a sample. The first-class scientific contributions of Dr. Hubbert are impossible to list in a short blog. Suffices it to say that starting from resource estimates and plate tectonics to migration paths of hydrocarbons, modern exploration, rock mechanics and rock physics, King Hubbert and Shell Development he managed for over 20 years created the modern approach to hydrocarbon recovery. They also brought us computer memory, seismic processing with signal stacking, and the first significant deep offshore discoveries and development. Forty years later, the oil and gas industry is still living off of the grand discoveries made in Shell Development. In 1963, one year before Hubbert retired, Shell was so far ahead of everyone in offshore engineering that Shell had to make public some of its discoveries to start bidding on federal leases. By law, there had to be another bidder. The big auditorium at the venerable Bellaire Research Center was filled with industry representatives, each paying $100,000 ($750,000 in 2011 dollars) for his seat. In 1979, first deep offshore oil flowed from the Shell Cognac platform. Today, 20 percent of all oil worldwide is recovered offshore as a direct consequence of the pioneering work by Dr. Hubbert and his fellow-researchers. Shell Development, where I worked for 7 years, shaped me more as a scientist than 18 years at UC Berkeley and 3 years at UT Austin combined. Now on to Hubbert peaks. In 1956, King Hubbert presented to the world a decade of his revolutionary thinking at Shell and predicted a peak of oil production in the U.S. in 1970. Of course he was widely ridiculed and dismissed by the vintage copies of Mr. Yergin, who still finds it impossible to conceive of finite resources. Then it happened exactly as Dr. Hubbert had predicted fourteen years earlier. Please try to find an economic forecast of anything significant in the world that lasts unscathed for more than a quarter. In 1929, for example, the Harvard Economic Society declared that a depression was “outside the range of probability.” The current depression started in December 2007, but through 2008, most economists predicted a 2.8% rate of growth of the GDP. As it often happens with the economists, they are not only clueless about the future, but also oblivious to the known measurable past. 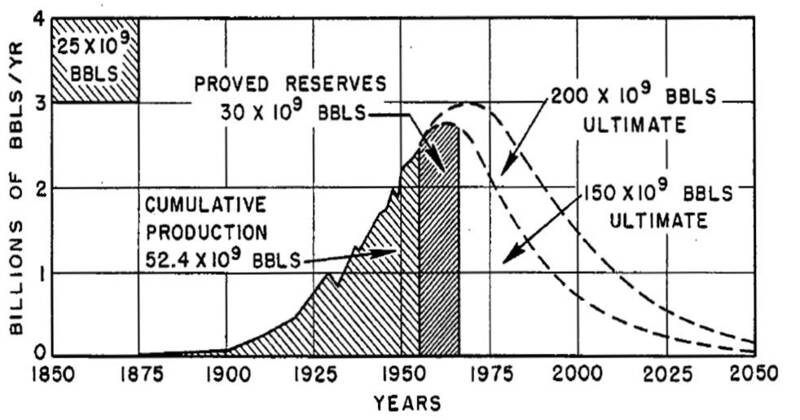 The 1956 prediction of the annual rate of production of crude oil in the U.S. Note that King Hubbert did not know about the future Prudhoe Bay (the largest oil field in the U.S. producing since 1977), deep offshore production (starting in late 1980's), horizontal wells and massive hydrofracturing (starting in late 1990's). 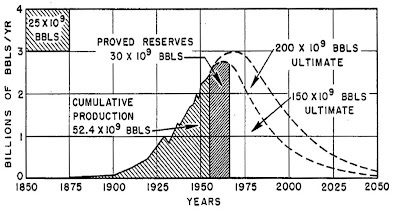 Yet for 2010, or 54 years later, Hubbert's higher estimate predicts 2.7 million barrels of oil per day, or 50 percent of the actual production rate. With the benefit of more production history, a better estimate of crude oil production rate in the U.S. can be obtained with a multi-Hubbert peak analysis that accounts for the newer populations of oil fields and wells. I have calculated that an extra 50 billion barrels will be produced in the U.S. as a result of new discoveries and revolutionary changes in technology. But, just as Hubbert predicted in 1956, crude oil production in the U.S. peaked in 1970, and there is nothing we can do about it. 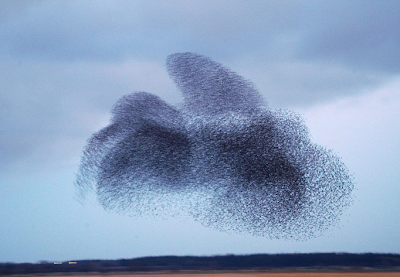 I could continue to explain how Hubbert curves must arise from a set of weakly correlated random variables (many oil or gas fields, or large groups of wells with arbitrary production histories), but we described this emergence elsewhere. I must warn the readers that mathematics (pardon my language) was used. Incidentally, we predicted that the world coal production rate would be peaking right now, together with the crude oil rate. In summary, might I suggest that for his self-preservation Mr. Yergin ought to stay away from the giants of science? They always win in the long run. Does anyone remember who Grand Duke Ferdinand I de' Medici or Cardinal Maffeo Barberini were? Probably not, but we do recognize Galileo's name instantaneously. A cold war journalist, historian, and a consummate gate keeper for the rulers of yesteryear, Mr. Yergin is like a sparrow. Sparrows fly close to the ground in noisy flocks and can never imagine what a lonely eagle sees from commanding heights. Dr. Hubbert was such an eagle. So was Galileo. P.S. Do you ever wonder how deep the human capacity for denial and self-delusion is? At what point people who do not tolerate a mere thought of the spherical finite Earth that revolves around the Sun will change their mind? A hint: Three hundred seventy years have passed since Galileo's death, but most of what we do unfolds much faster now. "Our new, field-by-field analysis of production capacity, led by my colleagues Peter Jackson and Robert Esser, is quite at odds with the current view and leads to a strikingly different conclusion: There will be a large, unprecedented buildup of oil supply in the next few years. Between 2004 and 2010, capacity to produce oil (not actual production) could grow by 16 million barrels a day -- from 85 million barrels per day to 101 million barrels a day -- a 20 percent increase. Such growth over the next few years would relieve the current pressure on supply and demand." 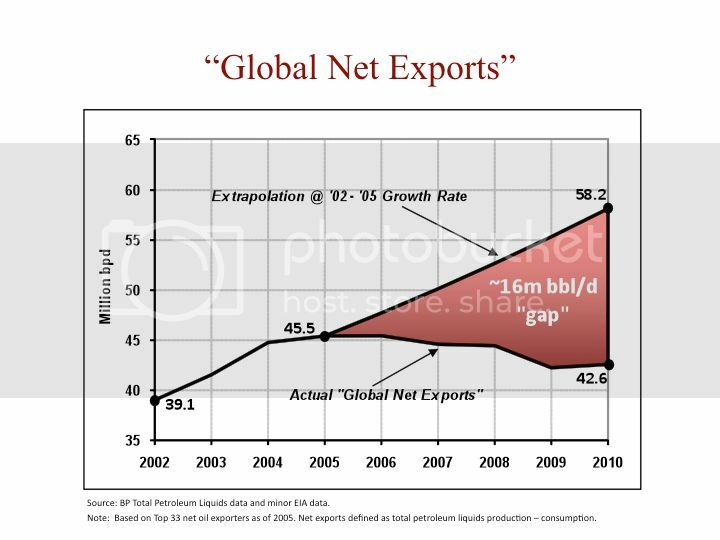 Jeff Brown has calculated that to maintain the 2002 to 2005 rate of increase in Global Net Exports out to 2010, in 2010 we would have needed (to close the 16 mbpd gap), another Saudi Arabia, another Russia plus another Norway (based on 2010 net exports). And, no, North Dakota will never be a "Saudi Arabia" of the Bakken shale oil or any other fossil resource. Hubbert's prediction of peak oil in 1995 was wrong. Also, current US production is 60% higher now, than Hubbert predicted, and is increasing - something Hubbert said was impossible. Ethanol production is also increasing in the US and is now being EXPORTED. So it looks like you were wrong about both eh Patzek? Hubbert correctly predicted the peak of U.S. petroleum production rate in 1970-71. As I am writing this note, we are importing 2/3 of our oil consumption and export finished petroleum products, simply because our demand has dropped, but we have excess refining capacity. The current U.S. petroleum production is some 50% higher that that predicted by Hubbert 56 years ago, but still much below the 1970 peak. Nonassociated gas liquids are now reported as petroleum, but they are not. Ethanol is soil, water and fossil fuels in disguise. Thank you. It so frustrating that the end of cheap oil is a taboo subject. What will it take ? How will the facts force themselves into the conversation? Richard Heinberg, Jay Hanson and many of their readers are also eagles.